Enjoy all that 209 Beach Place has to offer including Italian porcelain tile throughout and newly remodeled kitchen, with natural maple cabinets, stainless steel appliances, and granite countertops. The large living area provides plenty of natural light and includes a new flat panel television. 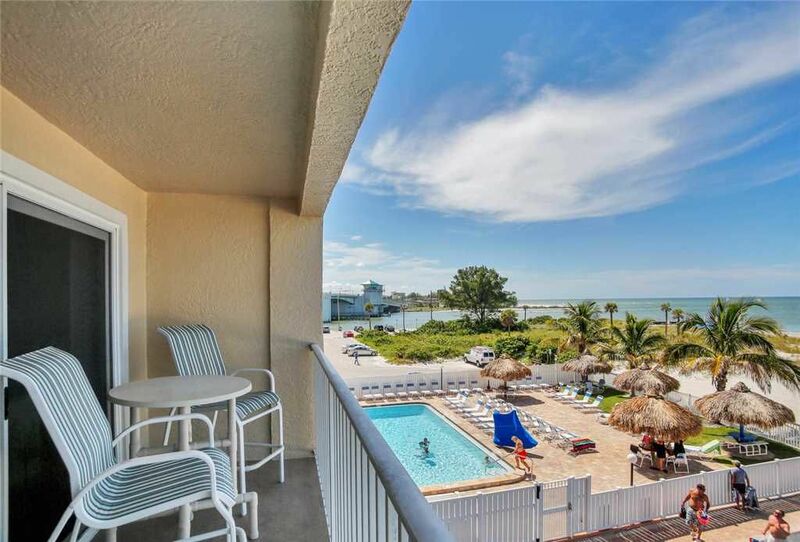 Step outside to the balcony and take in the beautiful beach views. Imagine watching the sunsets from this beautiful area throughout your stay! Updated master bedroom with two pillow top queen mattresses and television. The master bathroom has granite counter, new sink, faucet and lighting with decorative tile surrounding the bathtub and shower area. Kitchen utensils, linens, extra towels and pillows are stocked for your visit and washer and dryer are here for your convenience. Free Wifi is also included. Great place, clean, super comfortable. View from the balcony is the best - you can watch dolphins, beach goers and check the availability of pool chairs all at the same time. We really recommend this place, especially this very unit. We have vacationed with Sunhost several times, and this most recent stay was as enjoyable as the rest. Sunhost staff were extremely friendly and accommodating. Everything was perfect, the unit was clean and comfortable, and the facilities were excellent. Will definitely contact Sunhost for our next holiday booking. We love room 209 we stayed in it two times now wonderful view beds were comfortable although the can opener didn’t work ! But I managed but the space is beautiful and staff very friendly Pool is nice and the beach is awesome and the view is great!! Loved the condo! It was beautifully decorated, clean and roomy for a one bedroom. Loved the ocean view every morning. We stayed for two weeks so we would have liked if we had our own washer/dryer. We will be back. The unit was nicely decorated and spacious. Great location beachfront. Unfortunately, the unit wasn't cleaned very well. The floors were dirty and turned your feet black walking on the floors. The kitchen had coffee left in the pot from the previous people in the unit. Mold or mildew was our biggest problem, found on air vent in kitchen and all over the covering of the light fixture in the kitchen. We didn't stay the full week. There is a cleaning fee renters pay. We didn't get our money's worth. Property managers need to do a better job. We stay in Madeira Beach often but we will not return to this property. Great condo & perfect location! Condo & grounds very clean. Great pool & so close to beach. I would highly recommend Beach Place to family & friends. Will definitely visit again.